A delightful experience of special green teas masterfully blended with the sweet, subtle flavours of berries and cream and a light base of flower petals to create this range of Bouquet. These blends of green tea gives you a cup of tea that is deep and rich, and imbibed in exotic flower petals for an aromatic and romantic experience. White Magic is a unique blend of Milk Oolong green tea, unmatched for its taste. 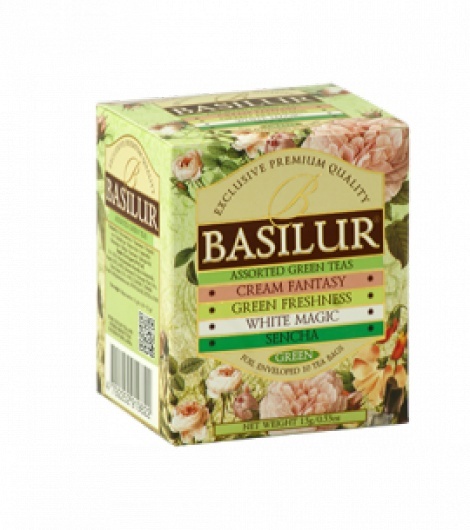 An assortment of four Bouquet teas - Green Freshness/Cream Fantasy/Sencha Green/White Magic to make this your favourite choice of purchase when it comes to fine, quality green teas combined in just a single pack. Ingredients: GREEN: Sencha green tea. GREEN FRESHNESSGreen Tea with mint flavour. 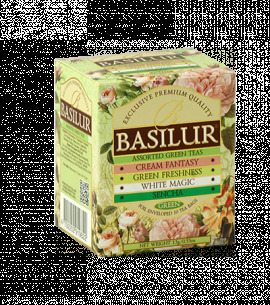 CREAM FANTASY: Green Tea, strawberry & vanilla flavour. WHITE MAGIC: Milk Oolong green tea.